This soundscape composition follows the bells in Salzburg over the course of a day, from 7 am to midnight, including the Palm Sunday celebrations where the congregation processes around the cathedral square. On special occasions such as this, the largest cathedral bell, Salvator Mundi, is rung. For many listeners the experience of this work will seem like a memory of such a day. Original recordings from the World Soundscape Project Tape Collection, recorded in Salzburg in March 1975. Sound processing realized with Soundhack convolution with spatialization created by Harmonic Functions’ TiMax2 matrix mixer. 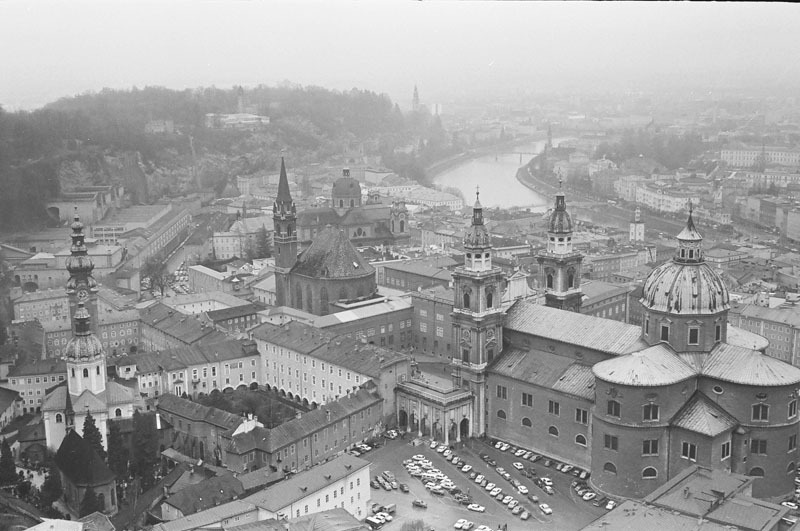 The Bells of Salzburg was premiered at the 2018 Crossroads Festival in Salzburg that marked the 60th anniversary of their electronic music studio. Salzburg Cathedral (right) as seen from Hohensalzburg above the city, with other churches in the vicinity as heard in the work. A detailed documentation of the entire work, its sources, processing and multi-track mixing scheme is available from the composer (truax@sfu.ca), as well as the 8-track soundfiles for performance.